We’ve gotten a good look at the Ork Clan Kulturs and put together our rankings of the Ork Clans from best to worst – Come take a look to see how your clan Kultur stacks-up! 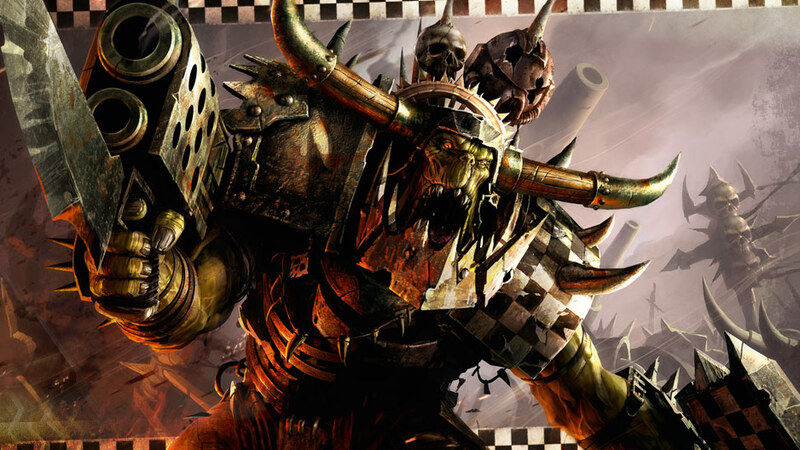 Now that we’ve got our copy of the Ork Codex, we’ve been looking at the orks and how we think they are going to shake-up the meta. Overall, it’s a strong book but we want to take a look specifically at the Ork Kulturs (aka chapter tactics) and see how they ranked-up compared to one another. We tried to look at these (mostly) in a vacuum, but some things were too obvious to ignore completely. Anyhow, this is our ranking for the Ork Kulturs. A lot of this also comes down to the type of Ork army you want to build. If you go shooting heavy, there are arguments to be made to shift these around a bit. Same goes for a close combat heavy army. And if you really wanted to get crazy start including Warlord Traits, Relics, and clan stratagems…whew – talk about a headache. That’s why we’re sticking with JUST the comparing the Kulturs. Mostly. This Clan Kultur is our #1 pick. 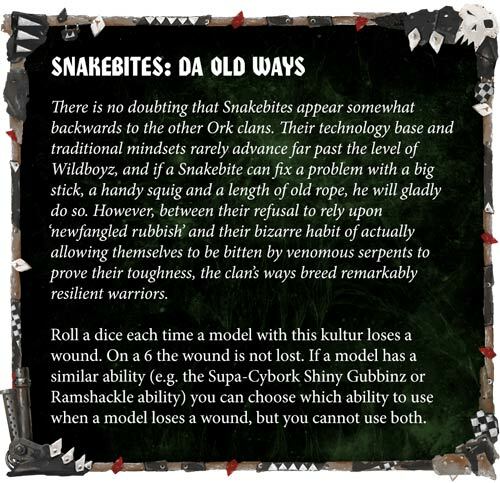 Not only does every ork model get a 6+ invulnerable save (which means your entire army is ~16.6% tougher than it should be) but each unit ALSO gets a free re-roll for a hit, wound, or damage roll each time it shoots or fights. And if that’s not enough, all the Infantry basically has objective secured, too! This Kultur is essentially 3 Space Marine Chapter Tactics all rolled into one, it’s a 3-for-1 deal that just seem too good to pass-up. This one is for all you Orky Players that wish you could be just a little more accurate. 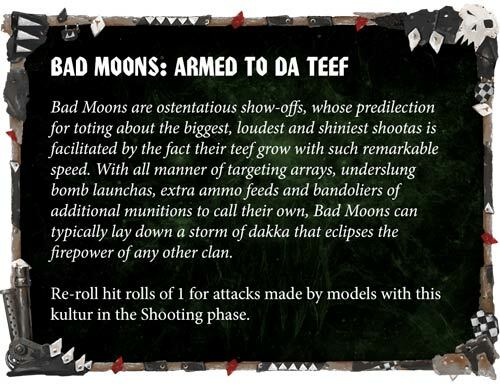 Honestly, we here at BoLS kept going back and forth between this and the Bad Moons, but we think this one is better overall. Why? Well for starters, if 1 Freebooterz unit gets the final blow on a unit they generate a MASSIVE 48″ bubble of +1 to hit for that phase. Just think about that for a moment. 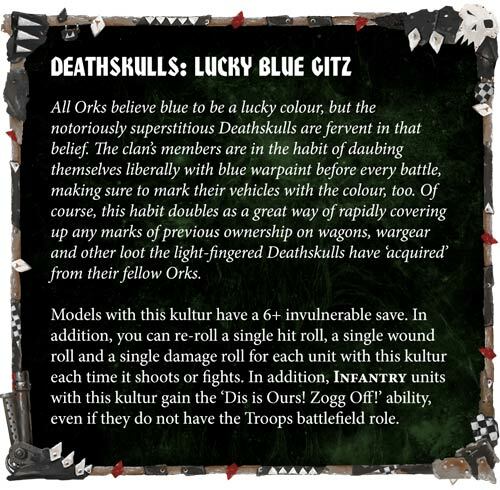 If this happens during the shooting phase, suddenly orks are hitting on 4+ instead of 5+ and that’s just the non-dedicated shooty gitz. Also, this ability can be triggered in the Fight phase, too. And now your Orks are hitting better than marines in close combat. Those Power Klaws are back to hitting on 3s as well! This is a massive boost across the board and we think it’s got a lot of potential. The Red Ones Go Fasta has the means to make Orks scary fast. 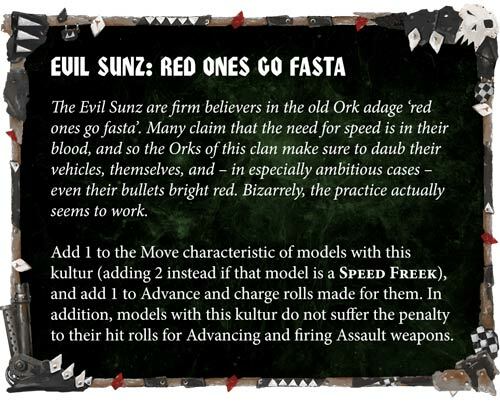 If you’re wanting an Ork Army that will be able to successfully get across the tabletop and get into close combat, Evil Sunz are the way to go. We can’t overstate how much those extra inches add up and if you are wanting a Speed Freek force it goes double for them! The Wartrike will net 4 extra inches and can let folks charge after advancing. Oh and you can still shoot your Assault Weapons without penalty. Does moving, advancing, shooting and charging sound good to you? Because the Evil Sunz will let you do all that – and you don’t even need to speed CP to do it! This Kultur is one of the more straightforward ones. Every shooting attack gets to re-roll 1s to hit. Orks will toss out a lot of dice and getting to re-roll those 1s will certainly add-up. Again, we were comparing this vs the Freebooterz and just felt that it’s good, but not as powerful. It only works during the Ork’s shooting phase and while it doesn’t have the same range restriction, it’s still just re-roll 1s to hit. This is Ork shooting we’re talking about, too. So most of the time you’re hitting on 5s and 6s. Now, there are some units that can really use this (looking at you Shokkjump Dragsta) – but overall, it’s weaker than the above options. Man, if this didn’t have the 18″ range distinction, then it would have been a lot better. However, it does which is why it’s much lower on the list than it could have been. On the plus side it does allow units to shoot or charge after Falling Back – which can be pretty powerful! It’s not a terrible Kultur overall, but it’s also not super impressive either. Man oh man this could have been better. If this was just a hit roll of a 6 generates an extra attack that would have been pretty sweet. Unfortunately, it’s an unmodified hit roll so no +1 or -1 mods need apply. 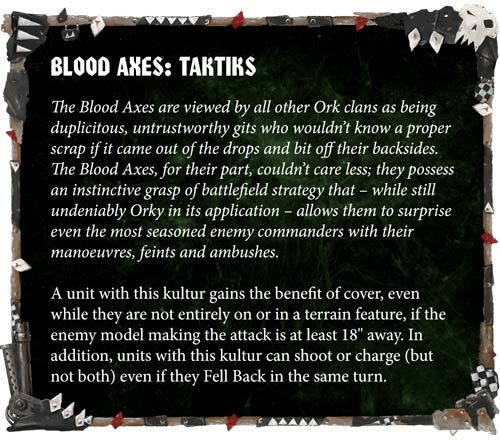 Also I get that GW doesn’t want “exploding 6s” but this is ORKS – we could have let them have that one thing, right? Oh well. You’ve at least got a ~16.6% chance to get another swing. And Orks are accurate in Close Combat. Honestly, I personally think that the Goffs got hozed because they have Ghaz as their character. Any buffs to the Goffs would apply to him. Same goes for their (comparatively) lack-luster Warlord Trait. 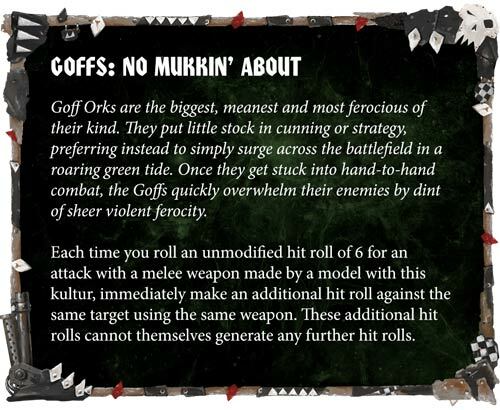 GW dialed down the Goffs because they didn’t want to make Ghaz any meaner than he already was…too bad. Everything in your army has a “Feel No Pain” save on a 6. But it doesn’t stack with any similar abilities and it doesn’t make those abilities any better either. This power is VERY similar to the Lucky Blue Gitz ability, only without the re-rolls or the free “objective secured” ability to go along with it… So why would you take this over the option that is clearly just better? That’s why it’s the bottom of our rankings. What do you think of our rankings? How would you order the Ork Kulturs? Let us know in the comments section!